The ongoing opioid crisis in Alberta requires a coordinated approach from government, Alberta Health Services, regulated health professionals, and others. Pharmacists are front line health providers working closely with individuals prescribed opiates, in particular those who have the potential for dependence, misuse, addiction and diversion. Pharmacists are often the most accessible members of individuals’ healthcare team and play a vital role in their medication assessment and management. This includes many strategies including harm reduction. It is essential that pharmacists adequately assess and monitor individuals using opioid medications and work collaboratively within multidisciplinary teams to optimize health outcomes and minimize harm. The Standards of Practice for Pharmacists and Pharmacy Technicians provide a framework for appropriate patient care however, due to the complexity of opioid use, additional guidance and interpretation of the Standards is required. 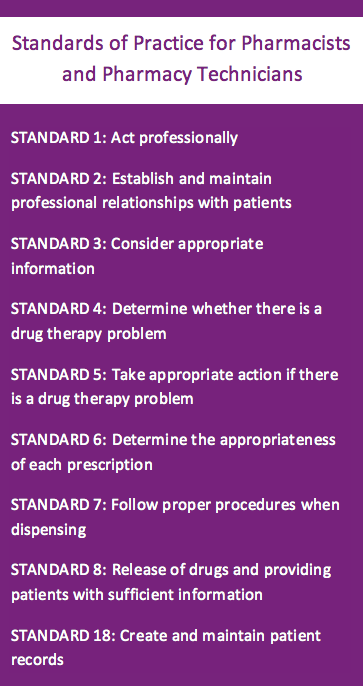 Adherence to the following guidelines, based on the Standards, is an expectation of practice. 1. Pharmacists must establish and maintain a professional relationship with each individual using opioid medications. 2. Pharmacists must complete a thorough assessment of each individual who is prescribed opioid medications or sold an exempted codeine product. 3. Pharmacists must document details of the assessment in the patient record of care and develop a written treatment plan for individuals using long term opioid therapy1 or for those determined to be at high risk of misuse or addiction. 4. Pharmacists must collaborate with the prescriber and other healthcare professionals involved in the care of individuals using opioid medications. 5. Pharmacists and pharmacy technicians must monitor individuals for the signs of opioid misuse, diversion, or addiction and take appropriate action. make individuals aware of the risks of opioids including tolerance, dependence, overdose, addiction and adverse effects such as sedation which can affect their quality of life. Ensure that individuals fully understand the risks and benefits of using opioids. as required by the patient treatment plan. A goal of assessment is to ensure that patients and prescribers consider all appropriate options before initiating opioid therapy and, for those patients that require opioids, that therapy is closely monitored. Determine the type, cause and nature of the individual’s condition and whether an opioid is the appropriate choice. Determine if the individual is opioid naïve (no opioid therapy within the last 180 days), if they have received opioids in the last 180 days and for what indication(s) or if they are on long-term opioid therapy. other non-opioid pharmacological treatments with a lower addiction potential. If the individual is opioid naïve, the initial total dose should be <50 Oral Morphine Equivalents (OME) per day and the duration of therapy should not exceed 1 week without reassessment. If doses are increased, they should be titrated upwards and the individual should be monitored for pain control and/or function improvement. For individuals using long-term opioid therapy, total doses should not typically exceed 90 OME/day and the individual should not receive more than a 30-day supply. referral to another health care professional specializing in chronic pain management. In circumstances, when it is determined that the dose or duration exceeds the accepted clinical guidelines, thorough documentation of the assessment, including a rationale, and an individualized monitoring plan must be created. potential drug interactions, especially those that may increase sedation. Canadian guidelines recommend against the use of opioids when the individual has an active substance abuse disorder or a history of substance abuse. The pharmacist must not dispense the medication under these circumstances without collaborating with the prescriber and ensuring the benefits outweigh the risks. Patients with mental illness must be assessed for stability before dispensing opioids. This involves a pharmacist assessment and/or collaboration with the prescriber and other involved healthcare professionals. Assess and monitor for potential and/or actual adverse drug events. Is the patient willing and able to use/adhere to the therapy? use of other medications that may affect opioid therapy. If the pharmacist identifies any of the above issues, the pharmacist should collaborate with prescriber and determine a suitable course of action. 3. Pharmacists must document details of the assessment in the patient record of care and develop a written treatment plan for individuals using long term opioid therapy or those determined to be at high risk of misuse or addiction. the individual exhibits signs of misuse, abuse or diversion including such as requests for early refills, evidence of the use of multiple physicians or pharmacies, or purchase of non-prescription opioids. 5. Pharmacists and pharmacy technicians must monitor individuals for the signs of opioid misuse, addiction, or diversion and take appropriate action. Tolerance and dependence are well-known risks of opioid therapy and can happen to any individual using these medications. refer the individual to appropriate addiction resources4 and/or other practitioners specializing in management of addictions. store opioid medications in a location where they are not accessible to others. When possible, opioid medications should be kept locked up to secure them from theft.